When Netflix first revealed their strategy to bring their streamed video service software to consumer electronics by licensing their software, they promised the licensing partnerships would be broad reaching. When the next earnings conference calls comes around, executives at the company will be able to say they have kept their word. After first announcing a deal with LG to tie into consumer electronics (DVD players and Set-Top boxes), then offering a standalone player in partnership with Roku, Netflix is now tackling gaming hardware. Monday, using the E3 gaming convention in LA as a forum, Netflix revealed a plan to bring their Watch Now on-demand video service to Xbox 360 owners. 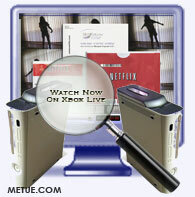 Access to the service, which provides unlimited “on-demand” viewing will require Xbox 360 owners have a “Gold” level membership to Microsoft’s Xbox Live network service. (More than half the group already does). Participants will also have to have a monthly subscription to Netflix mail order video rental service. (Netflix has about 8.2m subscribers). Those possessing both credentials will have unlimited access to watch the more than 10,000 TV and Movie titles in the library for no added fees. For them, the Xbox will be their gateway to Internet streamed on-demand rentals and their bridge between the Internet and the TV in the family room. Netflix Watch Now launched in January 2007. So far, the company has spent more than $40m developing the Watch Now software. Until recently, the challenge of taking the programming from the PC to the TV has been a significant hurdle. That changed about two months ago when Netflix revealed their partnership with Roku. The resulting, easy to use, standalone Roku player bridged the gap for just $99. It sold out in just two weeks. The Xbox 360 will be another route across the digital divide. Terms for the Microsoft partnership haven’t been released but some form of revenue share/affiliate fee and a possible upfront payment are probable. It also appears, the Xbox platform will be Netflix exclusive gaming partner. (Rival Sony is at work on their own video on-demand system for the PS3 platform). With Netflix CEO Reed Hastings on Microsoft’s board of directors, the partnership was widely expected. Netflix has pledged to reveal at least one more partnership this calendar year. They are also aiming to add thousands more titles to the Watch Now catalog. Non US Xbox owners shouldn’t feel left out. While the Netflix deal only applies to Xbox Live customers in the U.S., international customers won’t be fully excluded from new Xbox video services. Microsoft announced a separate deal for Europe that includes partnerships with MGM International and Constantin. According to Microsoft executive Don Mattrick the total number of movies and TV shows available to download and purchase from the Xbox Live Marketplace will now exceed 10,000. (This includes original Xbox-only programming and licensed Hollywood content as previously reported on Metue).